Daniel Webster poured himself anuther Jak Daniels the other night. Maybe he just drank it out of the bottel. I completelyt ubndderstand. As pictured on a variety of Twitter accounts and brought to Prep Rally’s attention by Busted Coverage, Hoover (Al.) High, one of the nation’s most high profile football programs, entered the field by bursting through a giant “run-through” banner with an enormous misspelled word during a recent preseason game. The banner, which was created by the Hoover cheerleaders, can be seen above. – ed. 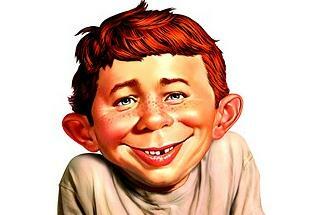 note—— Just wait till marijuana is legal… then we’ll see some relly ruffeld fethers. The ruffled feathers part of the message was a clever allusion to the Florence (Al.) High Falcons, who were Hoover’s opponents in the preseason scrimmage. 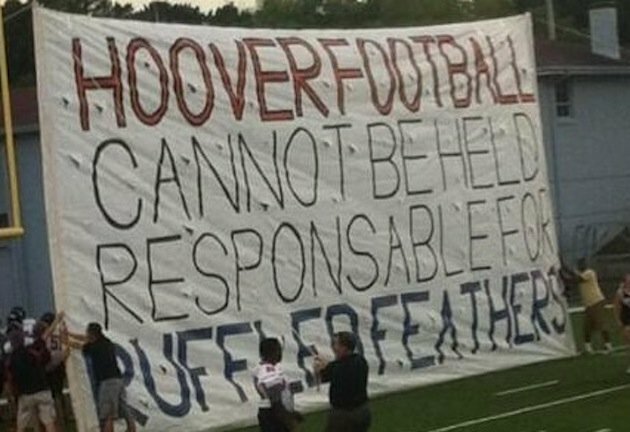 Luckily for Hoover, the game on the field was more successful than the banner-making exercise; the Bucs pulled out a 27-6 victory against Florence. * email your funny gifs, selfies (18yrs + only), optical illusions, playlists, lyrics, twists of irony, inappropriate questions, made up stuff and/ or comments to dpatlarge@yahoo.com . or not! This entry was posted in 15 Minutes of fame, Advice, Bikinis, Breaking news, Marijuana, Media circus, Mind over matter, Personal Achievement, Puzzles, Schlock news, Thinking big!, Trending Now, Uncategorized and tagged Cheerleading, Daniel Webster, Florence, God Bless America, Hoover, Optical illusion, Spelling, twitter by dp@large. Bookmark the permalink.